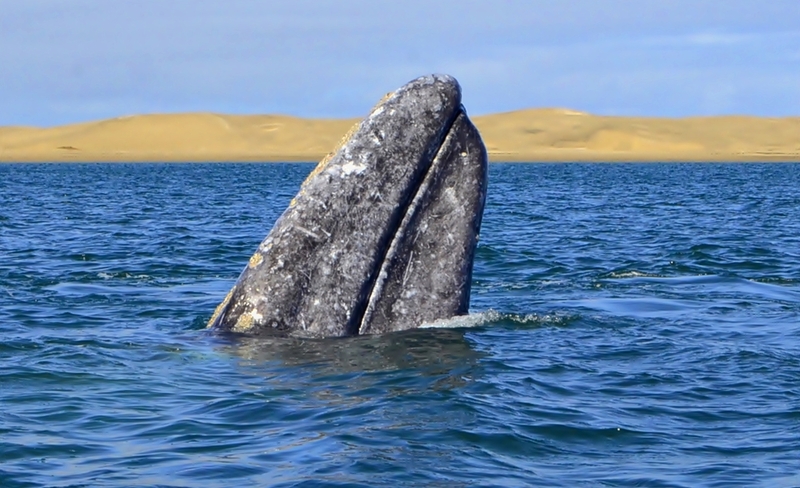 Historically, gray whales lived in the north Pacific and north Atlantic oceans. They live in relatively shallow waters over the continental shelves of western North America and eastern Asia. In 2013 a gray whale was sighted off the coast of Namibia, the first in the Southern Hemisphere, scientists think the whales might be repopulating old breeding grounds that have not been used for centuries. The much smaller western subpopulation summers in the Okhotsk Sea. The major known feeding grounds are off the northeastern coast of Sakhalin Island (Russian Federation), but some animals are occasionally seen off the eastern coast of Kamchatka and in northern Okhotsk Sea. Its migration routes and winter breeding grounds are poorly known. The larger eastern North Pacific population (approximately 26.000 indiviuals) summers and feeds mainly in the shallow waters of the Chukchi and Beaufort seas, and the northwestern Bering Sea; a few also summer and feed along the Pacific coast from Vancouver Island to central California. 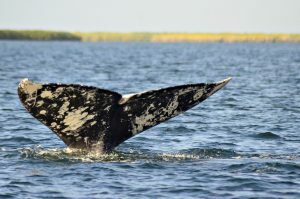 The population migrates in autumn along the coast to winter breeding grounds on the west coast of Baja California and the southeastern Gulf of California, in shallow bays and lagoons. 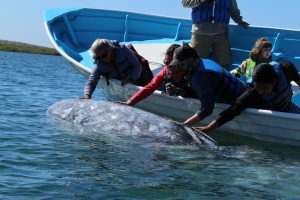 Gray whales are friendly,especially those encountered in the whale sanctuary of Magdalena Bay during the month of February and March, often approaching boats, reaching up to 45 feet in length and feeding by sucking in bottom-dwelling animals, mostly amphipods. They are gray with white patches, barnacles and lice attached to the whales. 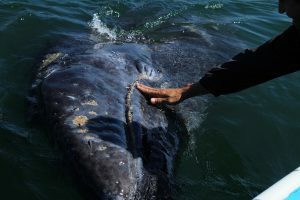 They have a small dorsal fin (low hump) and a series of six to twelve knuckles. Sparse hairs are found on the snout and their blows are usually low and heart-shaped. 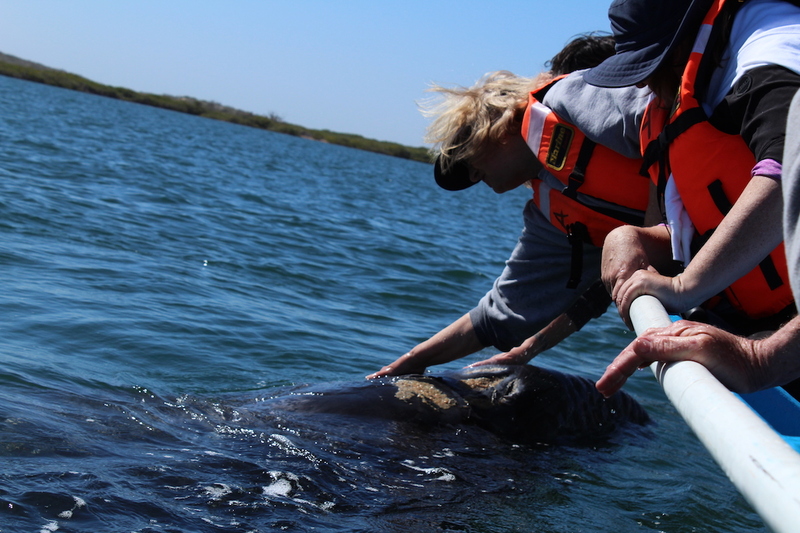 Threats to the eastern North Pacific population include increased human activities in their breeding lagoons in Mexico, climate change, acute noise, toxic spills, aboriginal whaling, entanglement with fishing gear, boat collisions, and possible impacts from fossil fuel exploration. 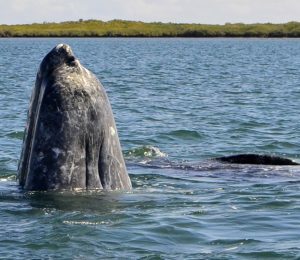 Commercial whaling during the 17th-20th centuries had an extremely detrimental affect on gray whale populations. Numbers were reduced significantly that the north Atlantic population is now extinct, and the north Pacific population nearly went extinct in the 20th century. 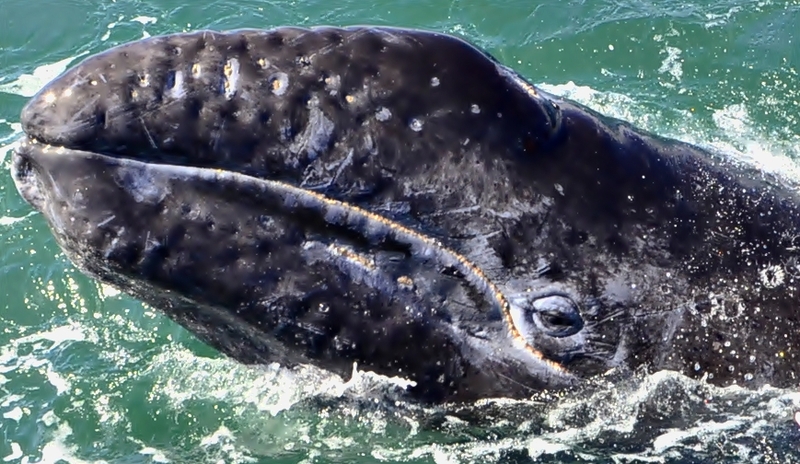 Fortunately, with protection in the US and Mexico, the eastern Pacific Ocean population has recovered to about 20% of its pre-whaling numbers and is now stable. The western Pacific Ocean population is still at risk of extinction. The recovery and continuing protection in the eastern Pacific, however, means that the species as a whole is now considered of least concern: In the specific case of Magdalena Bay the numbers of gray whales are increasing year after year. 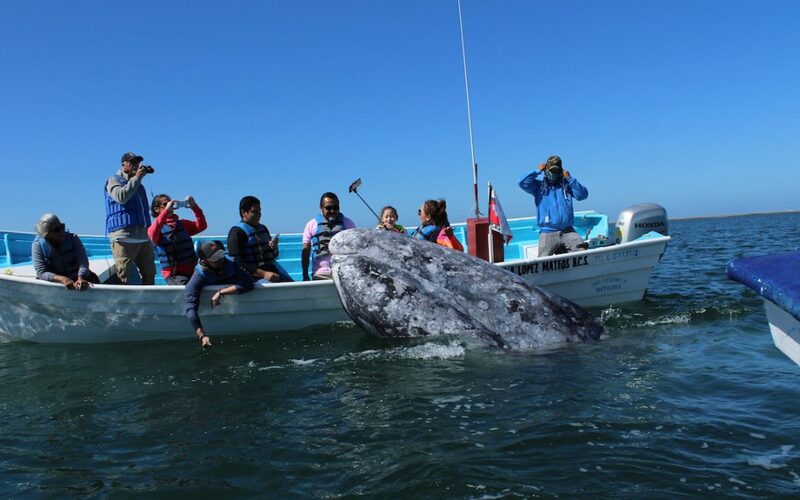 So don’t hesitate for too long, pack just a couple of things and a good amount of spirit of adventure and go explore the region a bit more in depth: the interaction with this animals in Baja California Sur is something unique in the world and people travel long distances to be able to pet or even kiss a gray whale.